Explore beneficial practices that bring out the excellence in your writing. Discover tools and techniques that will consistently improve your writing. Develop the lifelong habits of a professional writer. By applying the concepts in this book, you will master the craft of writing. All it takes is dedication and self-discipline. Each of the ten practices presented in this book expand your writing skills. You’ll find inspirational quotes, questions for thought and discussion, and activities peppered throughout. 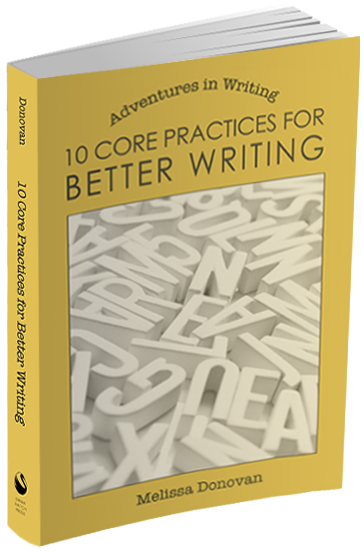 10 Core Practices for Better Writing is ideal for writing groups, classes, and workshops as well as individual writers who are ready to take their writing to the expert level. Writing is an adventure that lasts a lifetime. Start your journey toward better writing today. I would highly recommend this book for any writer, but especially for new writers and those trying to be more disciplined in their writing. The reason I chose to buy this book is that I want to eventually turn my writing hobby into a job. I want to be a part-time freelance writer, but I know I can’t do that unless I have the right habits in place. As with anything if you want to excel, you have to practice and practice often. Melissa Donovan gives great tips for maximizing time in your day to get a little writing session in. She also suggests different types of writing to make your sessions fun and interesting – everything from writing personal essays to turning those daydreams of yours into short scenes in a play. I also found the section on improving your writing particularly helpful. She explains how to review your writing for the mistakes you regularly make and working to avoid them. Her writing style is simple and straightforward, easy to understand. She doesn’t talk above you or below you, but right at your level. As I read the book, I almost felt as if she talking to me a friend, which I really like. She doesn’t come across arrogant or overly technical. Yet you can tell she knows what she’s talking about. This is a book I will return to often as I develop my writing career. I’m sure you will too.